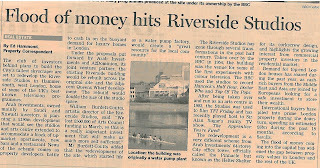 Todays Financial Times is reporting that a “club of investors behind plans to build the City’s tallest skyscraper are set to redevelop the Riverside Studios in Hammersmith, West London.” Arab Investments has been in longstanding talks with the Riverside Studios and Hammersmith and Fulham Council who owns the site. The paper says Arab Investments is “owned mainly by Saudi and Kuwaiti investors” who have teamed up with A2 Dominion and plan to include Queens Wharf as part of the £190m development. Likewise, there is no mention of how high this "block of upmarket appartments" will be. We should expect it to be smaller and less dense than A2 Dominion's last proposal because H&F Council said that had “inappropriate height and massing” but who could be confident of that with this Administration's record? I will report again on this once we find out more. Needless to say, residents are already concerned about the Conservative Administration's all too friendly attitude to property speculators and their propensity to wave through completely inappropriate schemes. If they plan that approach here then all the participants behind this scheme will have a long and ugly fight on their hands. They also seem to have something of a cavalier attitude to local history. 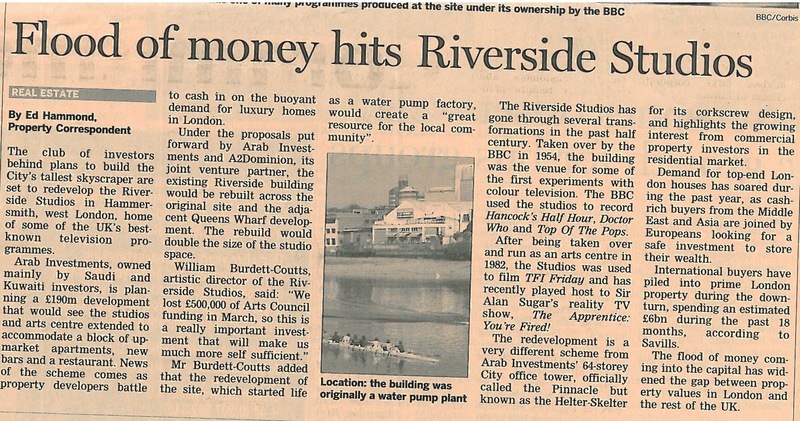 I can't believe they want to destroy Riverside Studios, which is quite frankly magnificent as it is (I recall in the early 90s when the place was falling apart - compare it to now! ).